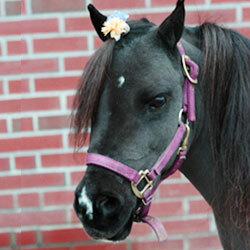 Mercy is a 13 year old, multi-champion AMHR registered Division A American Miniature Horse who has completed the criteria for the AMHR National Performance Hall of Fame in three disciplines (Hunter, Jumper and Halter Obstacle), was certified as a Pet Partner animal assisted therapy horse through Delta Society (her application for renewal is pending), and is a volunteer in the greater Rochester, NY area that visits schools, nursing homes and other civic events. She appears in The Book of Miniature Horses by Donna Campbell-Smith, Straight from the Heart II published by EQUUS/Primedia and will be appearing in A Cup of Comfort for Horse Lovers, to be published by Adams Media in April 2008. Due to her show schedule and her public appearances, SmartPaks are the best thing for us when we are on the road or at home. I don’t have to think about measuring the supplements that she and our other American Miniatures need. She is on Strongid C2X and Grand Coat currently and both keep her healthy, happy and looking her best.